You’re no longer in control. You can’t sketch out a idea, submit it to an art director for approval, and be sure you can create a photo-illustration that matches your sketch. Rather than just draw what you need, you become dependent on photos. If you can’t find the photos you need (specific subjects, poses), and obtain commercial rights to them, you have to modify your original vision. And once you’re forced to modify an element in your design, there’s a good chance you’ll need to make other changes. Pretty soon you’re ad-libbing, hoping it will all turn out right somehow. Second reason: a commercial illustrator needs a single established style. Ironically perhaps, portfolios with multiple styles foster doubts. An art director needs to be confident that when he gives an illustrator an assignment, the final art will have a certain look: a look consistent with the illustrator’s portfolio. Does this mean an illustrator can’t experiment with other styles for his own amusement or pleasure? Not at all. Experience has taught me, however, that an illustrator will have more credibility with a single-style portfolio. 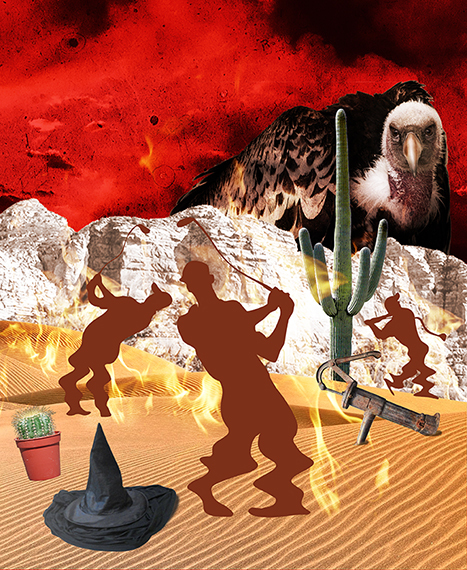 Having said all that (rather pompously), here’s my last 2012 photo-illustration experiment. It was done purely for my own amusement. 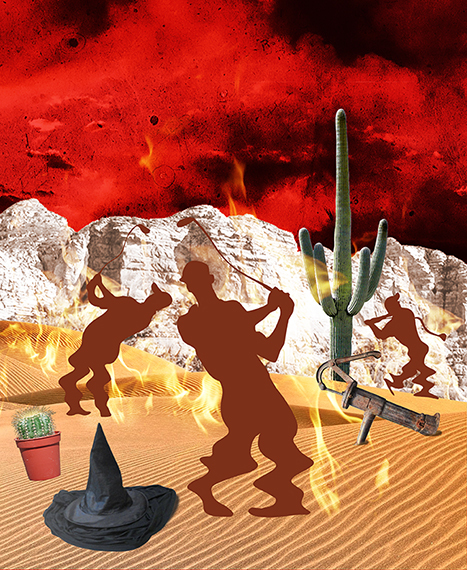 I had only a vague idea of “golfers melting in the sun.” I broke the first rule of illustration by not doing a preliminary sketch, and I ad-libbed my way from start to finish (blush). Here’s a quick look at how the piece evolved. on Stock.XCHNG, a free photo site. Then I pasted in cacti on different layers. The original silhouettes were black. I dubbed in various “hot” colors. I extracted flames from a campfire photo, pasted them in, and experimented with different layer blending modes. I used the Warp and Pen tools to distort the silhouettes, and added some additional props. I also enlarged the flames and made them whiter and more transparent. 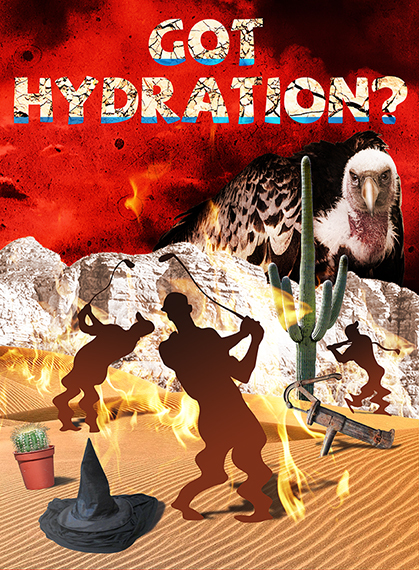 Finally: I added text, pasted in photos of water and dried mud, and used masks and blending modes to give the text a parched look. my “water” photo over the mud. I masked out most of the water, then experimented with blending modes and opacity to create the effect of being able to see the mud cracks thru the water. I found a good photo of a water pump, but it looked too pretty to have been lying out in the desert. So I added corrosion by pasting a “rusty metal” texture above it, and adjusting the blending mode and opacity. I masked out parts of the pump to partially bury it in the sand. This last detail image shows how the quality of individual photos can differ. 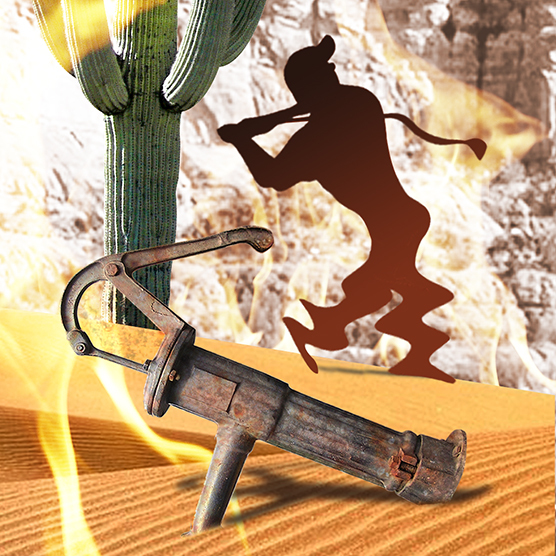 The potted cactus is very sharp, clearly from a high-res (resolution) image. By contrast, the “Wicked Witch puddle” was extracted from a grainy 72 dpi JPEG. I sharpened it and cleaned it up, but alas, there’s only so much one can do with a low-res image. Are you a fan of photo-illustrations? Do you have a portfolio? If so, do you restrict it to a single style? Did this post make you thirsty?? I certainly do not stick to one genre. This one is fun. I adore the witch’s puddle. Great touch. Must confess, that witch’s puddle still makes me laugh today. The Wizard Of Oz is, what– almost 75 years old?? Talk about an enduring image! I take it the witch did not survive the blazing sun. Beautiful work. Your how-to is well done. This is really interesting, you make photoshop look easy. Thanks, it’s from a recent blog post of mine. As you know I have a portfolio but my style ranges, which I do worry about, but my use of colour is mainly the same in all my works. It all depends on the project I work on really. Sometimes it can or can’t work to our advantage. Love the cracked mud text, the ground texture really looks parched! I wouldn’t worry too much about having mixed styles in your portfolio at this point. That’s very natural for a university student whose just completed her design degree. I’m sure your style(s) will continue to evolve as you work thru various projects. Very interesting… How long did it take you to do the whole illustration? How long did I work on it altogether? Boy, that’s a tough one, Teasa. I checked the “created” and “last modified” dates on the snapshot images in the post. I started it way back on June 21, 2011, and it looks like I did most of the work between then and June 28, 2011. However, I see my final had a “last modified” date of January 18, 2012– so it looks like I did some additional tweaking. A lot of hours, that’s for sure. That’s a point worth thinking about: manipulating a lot of outside elements takes time; and without a plan, one can waste a lot of time on failed experiments. Having a sketch and a plan makes you a lot more efficient. So does drawing all the elements yourself. Many thanks for your interest, and for a good question. Thanks for the reply, it’s very interesting. I agree with your comments about having a plan- I can waste infinite amounts of time without actually meaning to – unless I have a plan and stick to it! Photo-illustration strikes me as derivative work, and while that’s not necessarily bad, I think many folks see derivative as lesser or inferior. An excellent point, Jak. Photo-illustrations are a bit like music sampling. There’s definitely skill involved, but you’re using bits and pieces of other people’s work. That’s a far cry from creating something wholly original. Thank god I kept a glass of water close by. 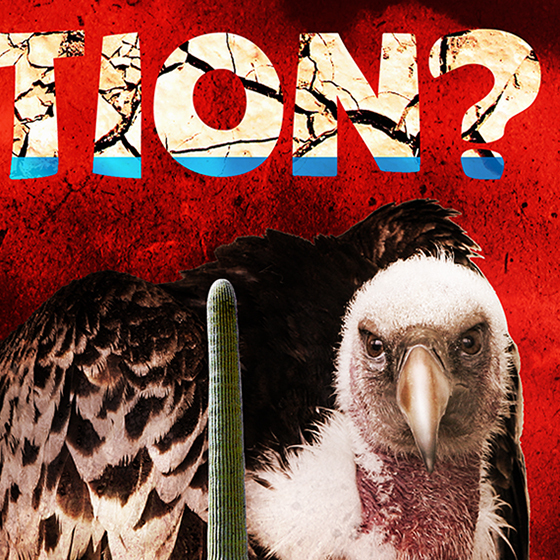 Is it just me, or is the vulture peering into my soul? LOL!!! LOVE this! It has a tippy, whoozy, wildly spinning vibe to it, like when we feel faint – or when we’re MELTING! You’re a real master with Photoshop, Mark, and it shows here. You’ve integrated all the various components beautifully! ::applause:: for the flames and golfers AND that magical font. Can’t deny it Mark, you have to find your own path and walk it too! 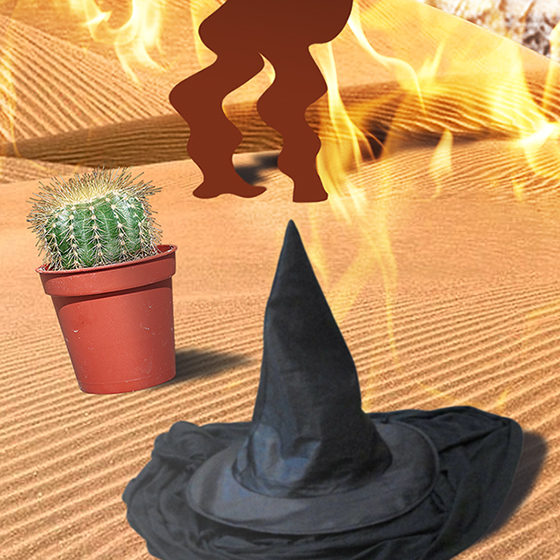 But, I quite liked what you did with the photo-illustration described, except I would have liked the cactus pot buried deeper in the sand to reduce some of its high-rez obtrusiveness, and sand grains on the witch’s puddle blown over by the wind. Please don’t mind the comments. Even Picasso’s work is not perfect. Maybe, somewhere there is a middle road, where you can merge the best of both worlds (cut-and-paste photo elements and hand-drawn illustration), and create some magic out of it. Life is a constant struggle, but you’re surely putting up a good fight! All the best. What a great comment: wit, charm, and an excellent critique– thank you! Loved your point about having to find one’s own path– how often we forget that basic truth. 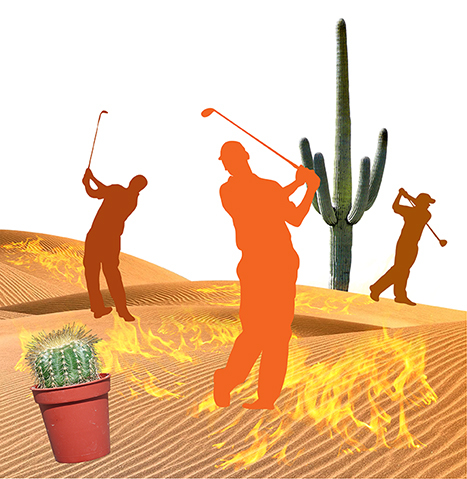 You’re absolutely right about the cactus pot. Now why did I think to partially bury the water pump, but not the cactus pot?? And some grains of sand on the hat would have added credibility to the scene, and helped relieve the hat’s dull blackness. Your suggestions are excellent, many thanks for sharing them. As mentioned in another comment reply, I have tried combining hand-drawn and photo elements, as you can see in this Harry Potter tribute. I did like the result, and I think it had a lot more energy than a composite using photo elements alone. What a handsome bird 🙂 – So Wonderful and generous of you to take your readers through the process. The mud is the perfect candle on the cake. Glug glug glug glug glug …..aaaaaah, whew, hot stuff this post, lucky the tap is near, ummmm, faucet? Your illustrative style is, well, stylish, instantly recognisable and shows your ability as a draftsman. Good decision to leave the photo-illustration to the photo-illustrationists. I sincerely appreciate this kind feedback from artistic luminaries like yourselves. It is both reassuring, and, to use an overworked buzzword, empowering. I’ve developed a style that works and feels natural– why dilute it with elements that seem artificial? I shall leave photo-illustration to true enthusiasts, and wish them well.